I am happy to be in an show during May at the Cerulean Gallery, in Philadelphia, PA. I will be showing gouache paintings. People often ask what gouache is, and why I like working with it so much. 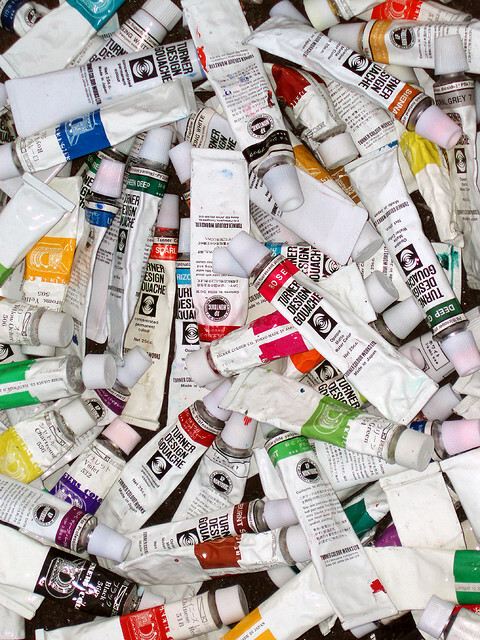 Here are five reasons I love working with gouache paint. Reason #1: No chemicals. This is a water based paint however, it is different from watercolor in that there is much more pigment in gouache. Reason #2: Immediate color. This heavier pigment gives the paint more of an opacity, which I do like, but if I need some transparency I can just add some water to it. Reason #3: I like to travel and take my paints. Gouache is very easy to use for this and dries right away. Reason #4: Layers. Also, by using a bit of an acrylic medium added to the paint, I can layer more paint on the dry gouache painting without taking the underlying layer off. I like working wet into wet gouache, then layering over it after it dries or the effect of white gouache on top, while it's still wet. Reason #5: Heavy metal. Often I will add some inks, black or metallic color. Now you can see all my reasons, in person, at my upcoming show. Hope to see you at the show, the opening is May 2, 2014 5-8 pm. There is also an artist talk on May 10th at 2 pm. The show will be up through May 24th, 2014. I want to share what I'm learning about painting and art with you here. This blog will feature reflections on my current paintings, art I admire, inspiration from everyday life.